As the InfoSec landscape changes constantly, so do the responsibilities of a CISO. Virtual Security Appliances are becoming more common in the Cloud environment. Similarly IoT and Software Defined Networking (SDN) is picking up steam and can’t be ignored by a CISO. 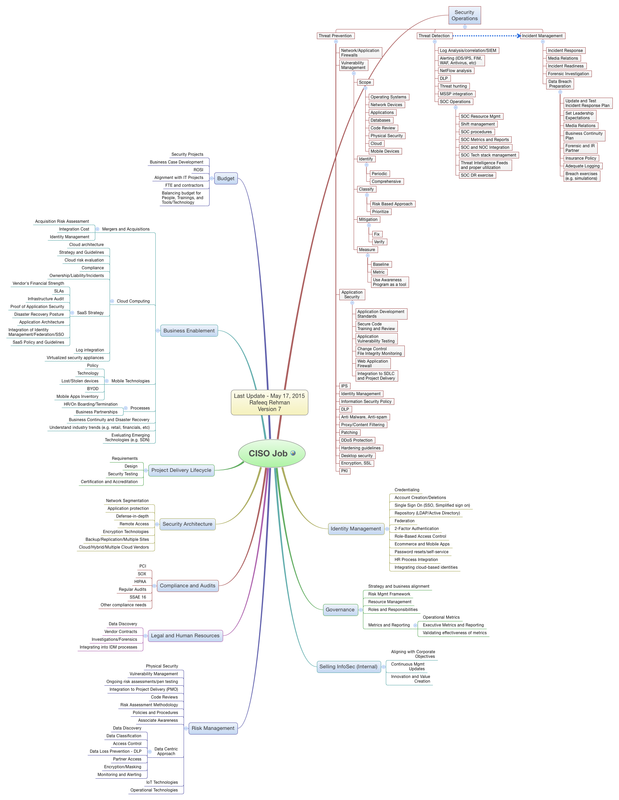 As many of you know, I have been publishing CISO Mind Map for a number of years. The last update was made in December 2014. I have added/updated some items based upon the latest industry trends and changes in the technology landscape, although a major part of the Mind Map is the same. Permission to Use – Like always, permission to non-commercial use of this Mind Map is granted as long as proper citations and references are provided. Any trademarks or service marks used in the Mind Map are the property of their respective owners. PDF Download – PDF Download of the Mind Map is available at this link. This entry was posted in InfoSec and tagged ciso, mind map, SOC, strategy. Bookmark the permalink.